The Integers Conference 2018 took place in October, 2018. To view the annoucement, click here. 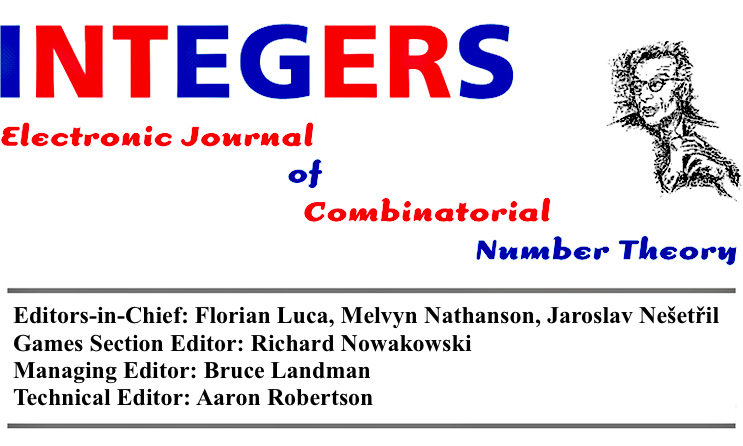 Integers is a refereed electronic journal devoted to research in the area of combinatorial number theory. It is published with the help of Colgate University, Charles University, and DIMATIA. Subscriptions to Integers are free. Integers does not levy any charges or fees for the submission of articles, nor for the processing of articles. We welcome original research articles in combinatorics and number theory, with a preference for those that have a connection to both fields. Topics covered by the journal include additive number theory, multiplicative number theory, sequences and sets, extremal combinatorics, Ramsey theory, elementary number theory, classical combinatorial problems, hypergraphs, and probabilistic number theory. Integers also houses a combinatorial games section. The principal subject areas, according to the 2010 Mathematics Subject Classification scheme, are: 05A, 05C55, 05C65, 05D, 11A, 11B, 11D, 11K, 11N, 11P, 11Y, and 91A46. All works of this journal are licensed under a Creative Commons Attribution 4.0 International License so that all content is freely available without charge to the users or their institutions. Users are allowed to read, download, copy, distribute, print, search, or link to the full texts of the articles in this journal without asking prior permission from the publisher or the author. This is in accordance with the BOAI definition of open access.